We’ve had our own chickens for a few years now. The appearance, taste and texture far exceed any eggs you can buy in the store. Even organic and cage free eggs. Did you know that cage free means there is a door and the chickens could go outside, even if outside the door is only a couple of square feet for all the chickens to walk around in. They may not be in a “cage” but the certainly aren’t free to roam as the term cage free implies. Sometimes our chickens like to hide their eggs. So when we find them, we’re not sure what day the chickens actually laid them. So we have to test them to see if they are fresh. To check for egg freshness, place the egg in a bowl of water. Make sure the water is a couple of inches above egg. If the egg stays on the bottom, it’s good. If the egg floats, it’s bad. This test comes in handy for store bought eggs, also. 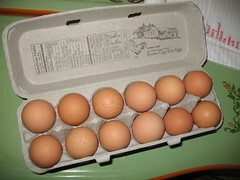 If your eggs are near or have passed the expiration date, you can test them to find out if they are still good. No need to throw good eggs away. For those of you that buy your eggs in the store, Dr. Mercola has an interesting article on Why You Don’t Want to Buy Organic Eggs at the Grocery Store. For more kitchen tips, visit Tammy’s Recipes. For more frugal ides, visit Frugal Friday. I love this post! I love getting farm fresh eggs, I will occasionally have a source, but my sources have lately run out, so back to store bought! I will have to do "the test" and test my eggs! Our chickens are laying about 5 or 6 a day – the difference between them and a store bought egg is like the difference between fresh asparagus and canned. I didn't know how to check them for freshness – we will be using this tip!